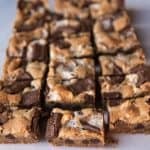 S'mores Bars are everybody's favorite campfire treat except in bar form and without the camping! Gooey marshmallows, buttery graham cracker crust, and melty chocolate, all in wonderful ooey, gooey cookie s'mores bars that you won't be able to stop eating! Preheat the oven to 350 degrees. In a medium bowl, mix together the graham cracker crumbs, melted butter, and sugar using a fork, then press the crumb mixture into the bottom of a 13×9-inch rectangular greased baking dish. Bake for 7 minutes, then remove from oven and allow to cool slightly. Meanwhile, cream the butter, shortening, and sugars together. Add in eggs and vanilla and beat well until light and creamy. Stir in flour, salt and baking soda just until combined. Then mix in the chocolate chips and marshmallows by hand. Carefully spread cookie mixture over the graham cracker crust by dropping spoonfuls of batter evenly around the dish and then gently pressing it together so you aren't disturbing the graham cracker crust beneath. Bake for 12 minutes at 350 degrees, then quickly remove from the oven, top with broken pieces of Hershey Bars and return to oven to finish baking. Bake 15-18 minutes more, until golden brown on top. The center should be mostly set but still just a little undercooked. Don't overcook - you want to eat these just a little on a the gooey side, trust me. Remove and allow to cool before cutting and serving.